© 2018 Kassimis and Raina. Catheter-induced aortic dissection during coronary angiography and Percutaneous Coronary Intervention (PCI) is a relatively infrequent, but potentially life-threatening complication. Patients who suffer this complication may require emergency aortic surgery. More recently, reports of treating the ostium of the dissected coronary artery have emerged as an alternative therapeutic option. In this article we describe two cases of extensive guide catheter induced dissection and their successful treatment using PCI and provide a concise overview of the available literature. Keywords: Iatrogenic, Aortic dissection, Cardiac catheterization, Percutaneous coronary intervention, Acute coronary syndromes, Guiding catheter. Aortic dissection during Percutaneous Coronary Intervention (PCI) is a rare, but potentially life-threatening complication which requires early recognition and emergency treatment. The treatment may involve conservative management, surgical repair or even bailout PCI. The successful percutaneous treatment of this complication during PCI for stable angina has been previously reported . In this series, we describe two guide catheter induced dissections of the Right Coronary Artery (RCA) during PCI for acute coronary syndromes. In the first case, the dissection involved the aortic root and in the second case, there was retrograde extension to the RCA ostium sparing the ascending aorta. We describe the successful percutaneous treatment in both cases and review the available literature. A 52-year-old male with a previous history of hypertension was admitted to our centre with an inferior ST-segment Elevation Myocardial Infarction (STEMI). Transradial Coronary Angiography (TCA) demonstrated a thrombotic occlusion in the mid portion of a dominant RCA with TIMI 0 flow (Fig. 1A). Primary PCI was carried out using a 6F JR4 Guiding Catheter (GC) and a ChoICETM PT (Boston Scientific, Boston, MA, USA) guide wire. Thrombus aspiration was performed using 6F Export®AP (Medtronic Inc, Minneapolis, Minnesota, USA) aspiration catheter which restored TIMI 3 flow (Fig. 1B, C). Pre-dilatation was performed using a 2.5mm x 15mm semi-compliant balloon (Fig. 1D). A Zotarolimus-eluting Stent (ZES) measuring 3.5mm x 34mm was implanted to treat the diseased segment (Fig. 1E). Unfortunately the inadvertent deep engagement of the GC during retrieval of the deflated stent balloon resulted in an extensive RCA and ascending aortic dissection (Fig. 1F). This was successfully sealed by the implantation of three more ZES measuring 4.0mm x 12mm, 4.0mm x 30mm and finally 3.5mm x 38mm from proximal to distal (Fig. 1G, H) with limited extravasation of radiographic contrast into the ascending aorta (Fig. 1I). Sealing of the aortic dissection and successful salvage of the RCA was possible due to prompt recognition and stenting of the RCA ostium. Subsequent CT aortography revealed a localised collection of radiographic contrast in the ascending aorta sparing the arch and the aortic valve. Transthoracic Echocardiography (TTE) did not reveal any evidence of pericardial collection and no evidence of aortic regurgitation. His remaining hospital stay was uneventful and he was discharged home 3 days later. Fig. (1). Extensive right coronary artery and ascending aortic root dissection successfully treated through proximal to distal stenting from the ostium. A 55-year-old female with a previous history of hypertension was admitted to our centre with a non ST-segment elevation MI. TCA revealed a severe focal distal stenosis of a dominant RCA (Fig. 2A). 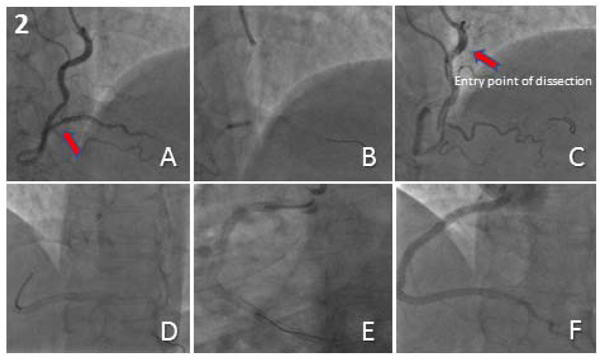 A Fractional Flow Reserve (FFR)-guided PCI to the distal RCA was performed using a 6F JR4 GC. Pre-dilatation was performed using a 2.0mm x 12mm semi-compliant balloon. An Everolimus-eluting Stent (EES) measuring 2.5mm x 16mm was implanted to treat the disease segment (Fig. 2B). Stent delivery proved difficult and required deep engagement of the GC into a tortuous proximal RCA, which unfortunately resulted in an extensive propagating dissection of the RCA involving the ostium but sparing the aortic root, with transient loss of antegrade flow (Fig. 2C). The dissection was successfully treated through PCI under fluoroscopic guidance without the use of any radiographic contrast. Four EES measuring 4.0mm x 32mm, 4.0mm x 32mm, 4.0mm x 28mm and 4.5mm x 20mm were implanted from distal to proximal (Fig. 2D, 2E) with an excellent final angiographic result and TIMI 3 flow (Fig. 2F). CT aortography confirmed the absence of aortic root involvement and TTE demonstrated normal cardiac structure and function. Her subsequent hospital stay was uneventful and she was discharged home 2 days later. Fig. (2). Spiral dissection of the right coronary artery successfully treated through distal to proximal stenting up to the ostium. Iatrogenic aorto-coronary dissection is rare with a reported incidence of approximately 0.062% of all cardiac catheterization procedures. The incidence of those involving the coronary tree alone has been estimated at 0.039% (0.006% during coronary angiography and 0.098% during interventional procedures) [2, 3]. Although the exact mechanism for the occurrence and propagation of iatrogenic aorto-coronary dissection remains unclear, it is believed that the entry point originates within the coronary dissection with retrograde extension of the subintimal space into the aortic root. This can occur due to trauma caused by the tip of the diagnostic or guiding catheter, subintimal entry of a stiff guidewire or due to balloon dilatation. The risk factors for aorto-coronary dissection include age, diabetes mellitus, hypertension, previous coronary artery bypass grafting, concomitant acute myocardial infarction, atherosclerotic burden and any underlying structural weakness of the tunica media [2-5]. Both patients described above although young, were suffering an acute myocardial infarction and had a previous history of hypertension. Neither had any evidence of aortopathy or predisposition to vascular injury due to Marfan’s syndrome or other causes of medial necrosis. Aorto-coronary dissections involve the RCA more than the Left Main Coronary Artery (LMCA) . This predisposition maybe due to the differences in the histological structure of the ostia of the RCA and the LMCA [2, 6]. The dissection usually occurs during the use of GCs and 6F diagnostic catheters. All access sites and catheter curves have been shown to be related with this complication. The most frequent shape of catheter responsible is Amplatz, followed by Judkins through the transradial approach and Judkins followed by Amplatz through the transfemoral approach . Dunning et al. proposed a classification of iatrogenic aortic dissection into in 3 grades: type 1, dissection limited to the sinuses of Valsalva; type 2, dissection of the ascending aorta beyond the sinuses but < 4 cm; and type 3, dissection ≥ 4 cm . When a coronary artery is involved as the entry point, it can usually be successfully sealed using conventional stents [3, 7], or covered stents if there is associated extravasation into the pericardial space . The use of intravascular ultrasound and/or fluoroscopy guidance during PCI is advisable, as repeated radiographic contrast injection may result in extension of the dissection flap . Progression of the aortic dissection with haemodynamic instability, acute aortic regurgitation, haemopericardium or intractable chest pain are indications for urgent surgical intervention . The integrity of the aortic valve should be assessed through echocardiography in all cases. Conservative management is a reasonable option for haemodynamically stable localized aortic dissections which should be monitored using serial CT aortic imaging and TTE [10, 11]. 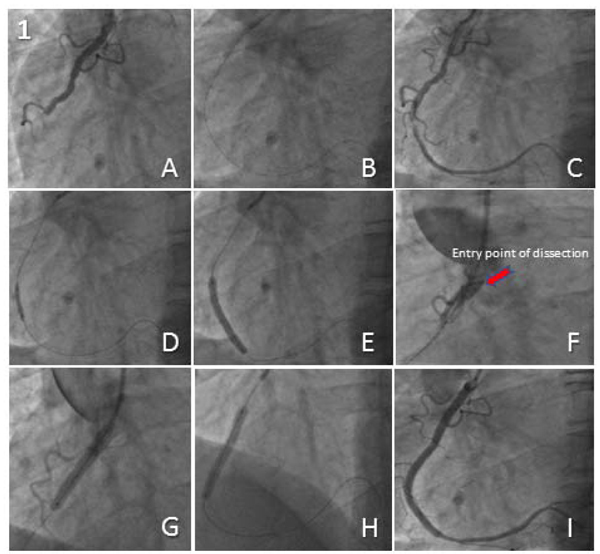 Percutaneous intervention of the RCA ostium is an acceptable alternative to surgical repair for the treatment of limited iatrogenic aorto-coronary dissection. If the aortic root is involved, the aim should be to seal the entry site of the dissection with PCI first, to prevent any further aortic extension. If the aortic root is spared, PCI using distal to proximal stenting under fluoroscopic guidance, without the use of radiographic contrast, can be safely performed with excellent results. Tushar Raina performed the cardiac catheterization and PCI for the first patient. George Kassimis performed the cardiac catheterization and PCI for the 2nd patient. Both authors have read and approved the final manuscript. Gürdal A, Yıldız SS, Kılıçkesmez K. Catheter induced aortocoronary dissection during percutaneous coronary intervention: Successful aortoostial stenting. Turk Kardiyol Dern Ars 2018; 46(1): 57-60. Boyle AJ, Chan M, Dib J, Resar J. Catheter-induced coronary artery dissection: Risk factors, prevention and management. J Invasive Cardiol 2006; 18(10): 500-3. Núñez-Gil IJ, Bautista D, Cerrato E, et al. Incidence, management, and immediate- and long-term outcomes after iatrogenic aortic dissection during diagnostic or interventional coronary procedures. Circulation 2015; 131(24): 2114-9. Januzzi JL, Sabatine MS, Eagle KA, et al. Iatrogenic aortic dissection. Am J Cardiol 2002; 89(5): 623-6. Dunning DW, Kahn JK, Hawkins ET, O’Neill WW. Iatrogenic coronary artery dissections extending into and involving the aortic root. Catheter Cardiovasc Interv 2000; 51(4): 387-93. Davlouros PA, Kontoprias K, Alexopoulos D. Iatrogenic left main coronary artery dissection mimicking complete proximal occlusion of the left main branches. Hellenic J Cardiol 2015; 56(1): 100-2. Carstensen S, Ward MR. Iatrogenic aortocoronary dissection: The case for immediate aortoostial stenting. Heart Lung Circ 2008; 17(4): 325-9. El-Jack SS, Pornratanarangsi S, Webster MW. Images in cardiology. Covering your mistakes: PTFE covered stents in iatrogenic coronary dissection. Heart 2006; 92(5): 608. Ogata N, Matsukage T, Toda E, et al. Intravascular ultrasound-guided percutaneous coronary interventions with minimum contrast volume for prevention of the radiocontrast-induced nephropathy: Report of two cases. Cardiovasc Interv Ther 2011; 26(1): 83-8. Tanasie C, Chandonnet M, Chin A, et al. Catheter-induced aortic dissection after invasive coronary angiography: Evaluation with MDCT. AJR Am J Roentgenol 2011; 197(6): 1335-40. Doyle B, Juergens CP. Conservative management of ascending aortic dissection caused by percutaneous coronary intervention. J Invasive Cardiol 2004; 16(2): 92-4.